Educate Tanzania » Why ETI? There are SO many causes and charities out there – Why would you choose ETI? 1. Educate Tanzania works through its strong and upright Tanzanian partner. They ‘own’ the project. They lead the work. They provide incentives for their own people to be part of the story. The project is successful because our partner, Karagwe Diocese (KAD) stands against corruption, has compassion on poor people and is so effective. 2. ETI listens to discern the real needs of the people of Karagwe. ETI conducts on-site needs assessments and identifies the needs of the community. No heavy-handed solutions created elsewhere. After all: It’s our partner who is ultimately responsible for a sustained solution. 3. ETI keeps Education at the forefront. Education is key to sustained solutions to complex problems related to poverty. Training in new technologies; advancements in agribusiness; market analysis and a raising of standards will help spur economic growth. 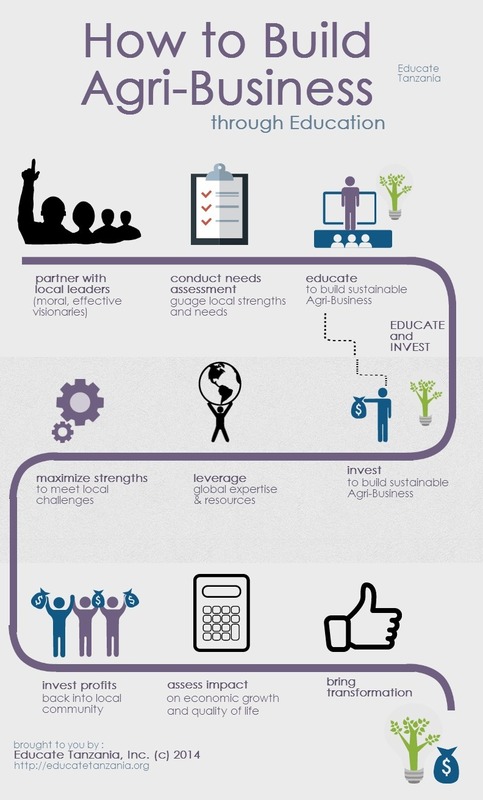 Education and Business (Agribusiness) go hand-in-hand to raise profits and open the revenue streams to spur growth. 4. Educate Tanzania is an excellent steward of donor dollars. Over 90% of ETI funds are used for programs in Tanzania. ETI uses its deep range of connections to leverage resources and expertise and has thus far reached an amazing number of milestones on the generous gifts from donors. Because of this (and more) ETI is a top-rated nonprofit. 5. ETI ensures that its work benefits the Tanzanian community. We ask other businesses and charities “Where do the ‘first’ monies go?” and “What percentage stays in the community?”. Revenue streams must point to the local community, must ‘first’ benefit the subsistence farmers in Karagwe, and must help alleviate poverty and empower women. 6. We embrace transparency and evaluation. ETI works with partners, the University of Minnesota and Cohn Consulting to design and carry out longitudinal analysis that describes the impact of KARUCO on the economy and on empowerment of women. Adjustments will be made based upon knowledge of what variables lead KARUCO to the most success. 7. We are ridiculously hopeful. But we’ve seen it before. Education leads to new methods. New methods lead to economic growth and empowerment of women. Growth and empowerment lead to conversion.